Usually if we show you a clip of some really fit person performing an impressive physical feat, it just makes you feel lazy and untalented. For example, there was that one a few months ago that showed Rajon Rondo demonstrating his insane vertical, or that one we just showed you yesterday of the high school cheerleader setting the Guinness World Record for most consecutive backward handsprings. However, the clip we have for you today is going to make you feel fat and stupid. You’re welcome! You see, what we have here is not just some ripped dude doing one-armed push-ups. 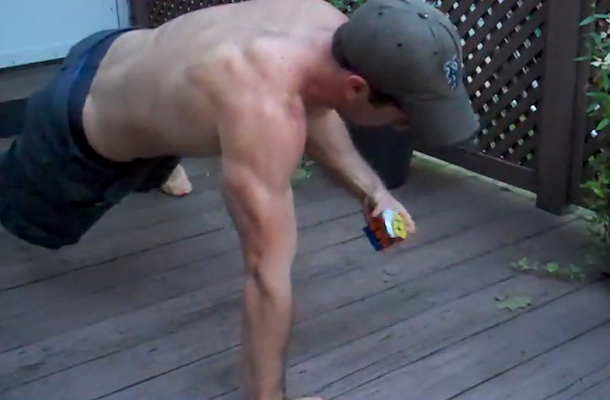 It’s some ripped dude doing one-armed push-ups while solving a Rubik’s cube in just 25 seconds with the other arm. Meanwhile, I took a pretty awesome nap yesterday. You should have seen it. Seriously, though, this is pretty impressive. At first I wondered what made this guy think of this, but according to the description on YouTube, it combines his two main hobbies: “lifting and cubing.” So I guess it was a no-brainer. By the way, who knew “cubing” was a thing?